deepin 15.4 has been released on April 19th 2017. This review reveals the visual aspects of this beautiful GNU/Linux operating system. 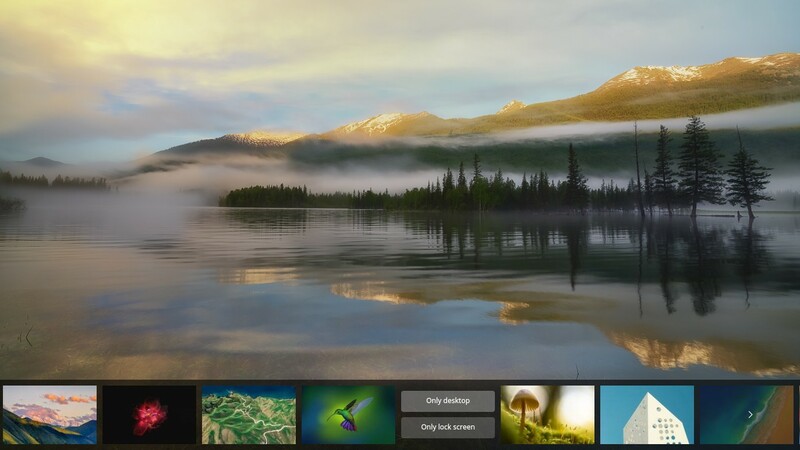 deepin is a very visual desktop OS where everything is accessible via GUI, and in 15.4 release it gets incredibly more user-friendly. 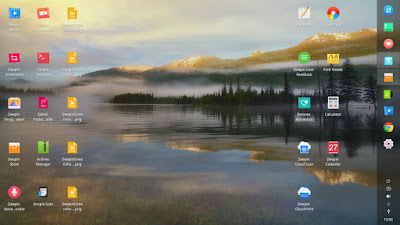 The desktop and all native applications are very pretty, being unique with its own concepts, with simplicity on every layout. 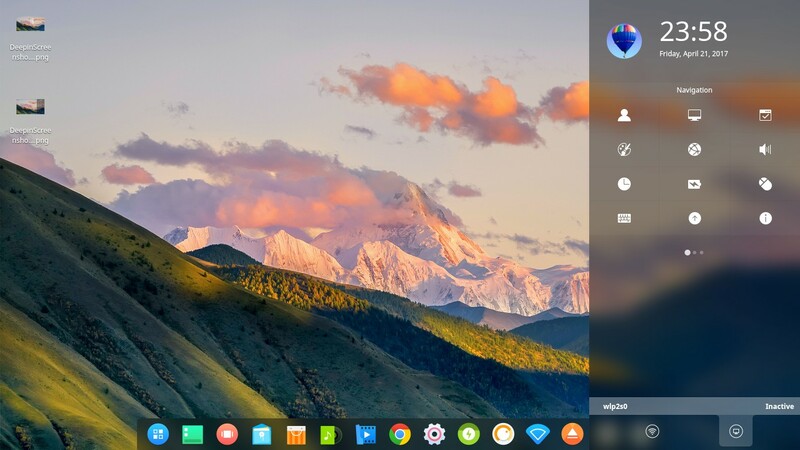 You will not find a desktop like this, not in MacOS, not in Windows, not even in Ubuntu, but only in Wuhan's developed system: deepin. This review talks less on technical but more on visual appearance. 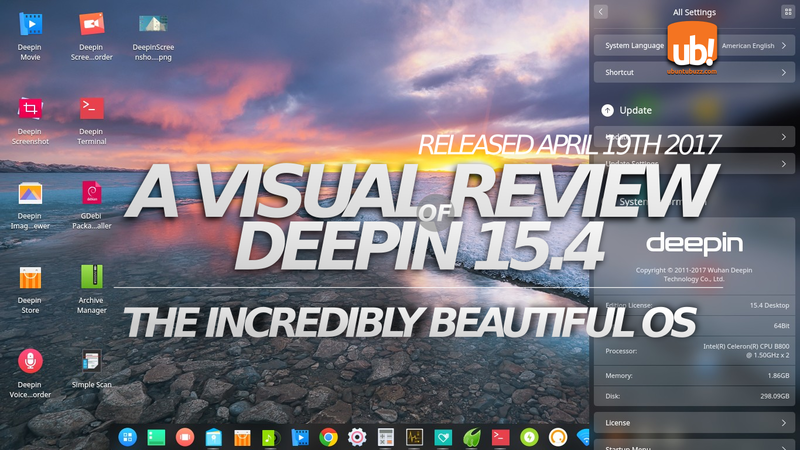 I make this so all new users can see what's wonderful about deepin. 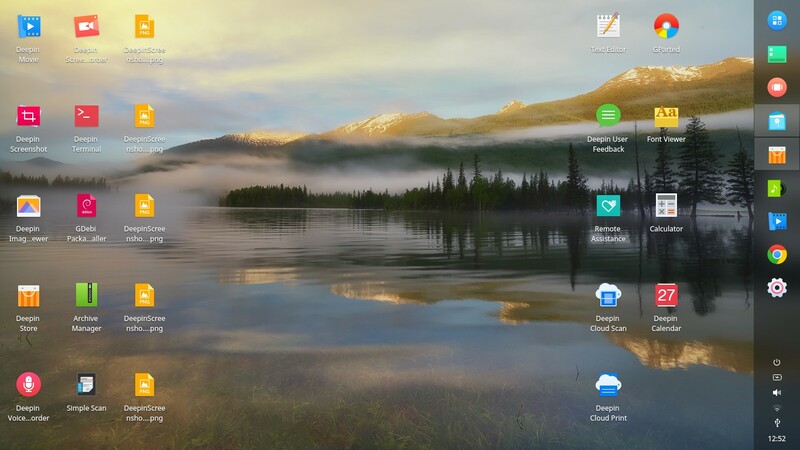 This is the user interface of deepin 15.4 with original wallpaper, bottom dock, and right sidebar. This review is going to examine its 3 main parts that are visually amusing: the desktop, the sidebar, and the dock. The desktop menu appearance is fullscreen, not a cascading one like on KDE or Windows. The login screen is also interesting. It shows simple design, with a centered login textbox, clock & date view on bottom-left corner. On lock screen (screen that locks your system after idling for certain time) you can still play audio (if Deepin Music is running behind) using control buttons on bottom-right corner. See play/pause and forward/backward buttons below. 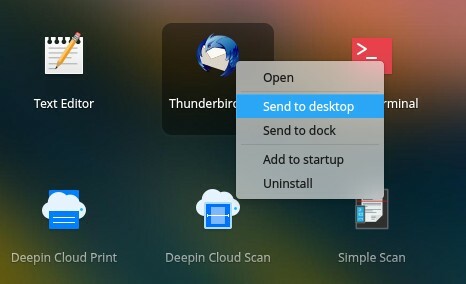 User interacts with deepin via 3 main desktop components: the menu, the sidebar, and the dock. Every application window has top-left close button, with menu button on the titlebar. All user & system settings done via sidebar (called Control Center) that can be shown by pointer-pushing, click on gear button, or right-click on desktop. Shortcut icons can be placed on desktop. The dock position choices are 4 (top-bottom-left-right), and its visual choices are 2 (MacOS-like dock or Windows-like panel). 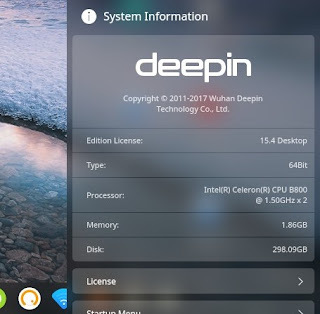 By seeing these facts we can grasp the concept of deepin user interface that is mixing many aspects from Windows & MacOS. 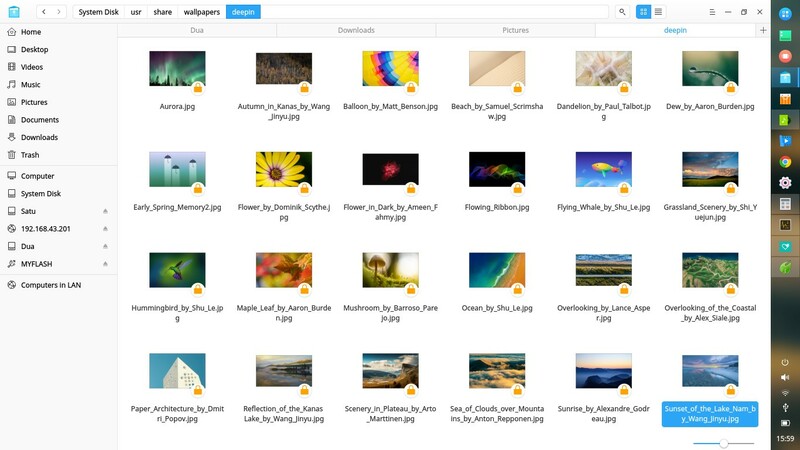 These are 24 new wallpapers for deepin 15.4. They're stored at /usr/share/wallpapers directory. As you may know, this set of wallpaper is beautiful like always, with very nice photographic quality. The way to change wallpaper is very familiar: right-click on desktop > Set Wallpaper > select one. It's still important to see memory info although this review is less technical. For you're curious, after freshly installed at idle time deepin 15.4 consumes around 730MB of RAM. It's surprisingly low compared to its Beta Version (reviewed), lower than Ubuntu Zesty (1GB), Ubuntu Budgie (850MB). This 700MB is a cheap cost for its beauty, although deepin can't beat Kubuntu Zesty (400MB) and Xubuntu (330MB). 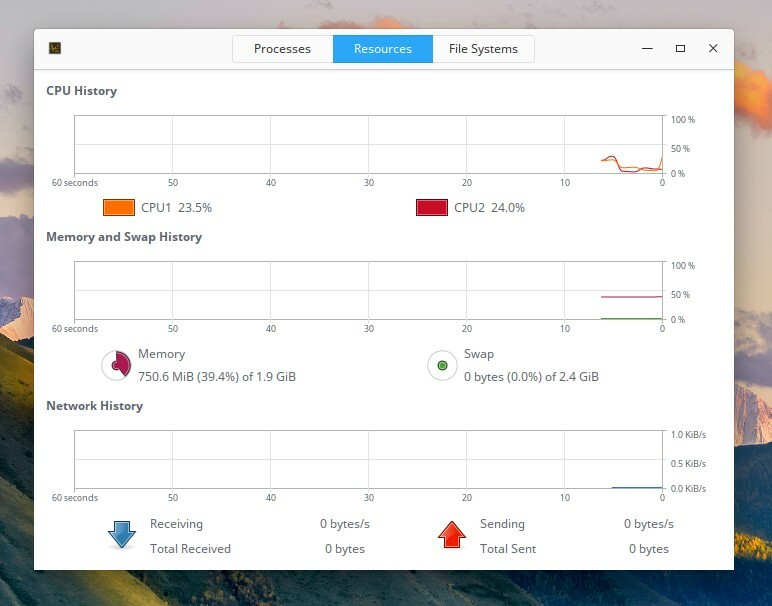 Surprisingly, deepin 15.4 consumes only around 730MB of RAM at idle time after freshly installed. To see more precisely, the most memory consuming processes here are python2 (48MB), deepin-wm (37MB), dde-launcher (33MB), and dde-dock (25MB). 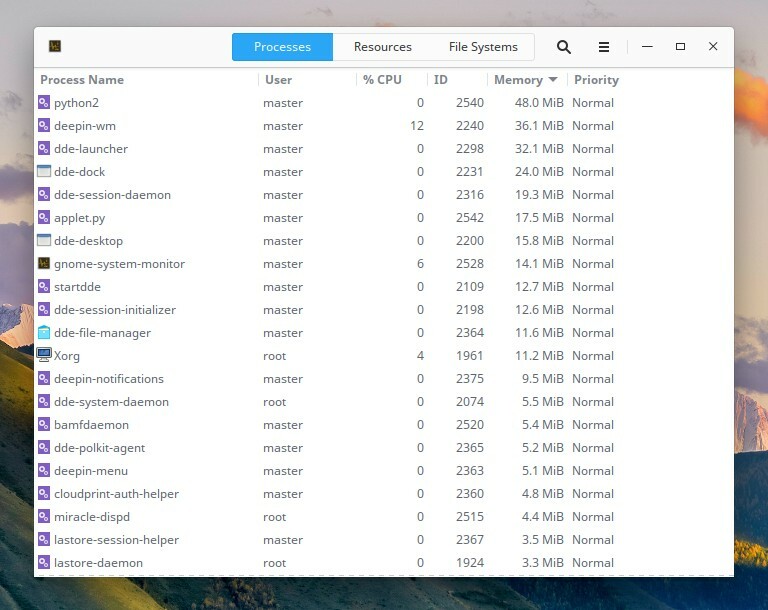 If you look closely, almost all hugest processes are deepin native's, as a cost of its beauty. And you should notice that python2 at the top is a process that runs Deepin Screenshot (the program I use to take these screenshots). 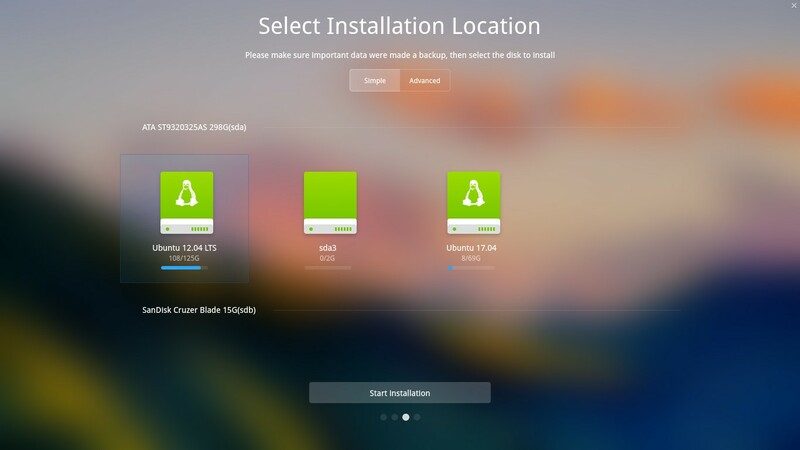 deepin 15.4 features a new OS installer that is very simple and focused. The design reflects the 15.4 style that is translucent. This installer has similar steps to Ubiquity (the system installer of Ubuntu), but with username creation in the beginning and of course its visual amusement. 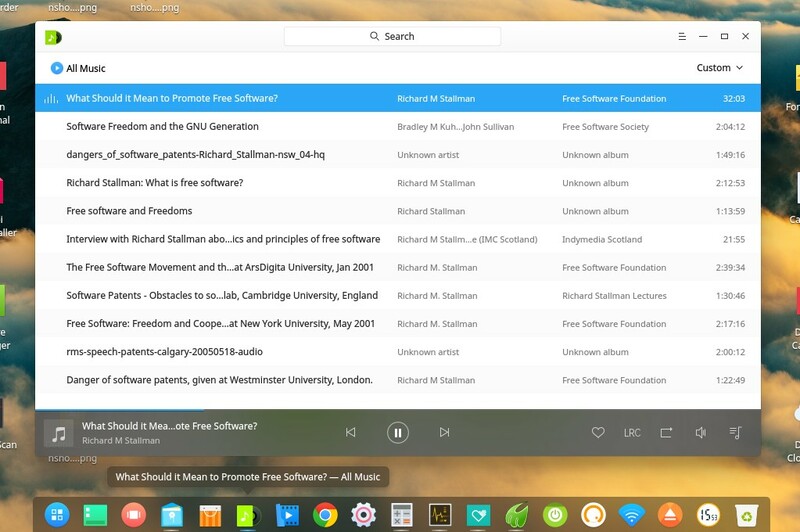 deepin has its own control panel as right sidebar, called Control Center. This sidebar covers all system settings, plus the awesome visual GRUB bootloader editor. The sidebar can be opened in 3 ways: by pushing pointer to bottom-right corner, by clicking on gear button, or by opening any component (e.g. right-click on desktop > Display Settings). User can rearrange GRUB entries and change the background image from deepin sidebar. It's very cool to see it could avoid non-tech users' mistakes in editing GRUB manually. This feature is brilliant, I cannot find any other distro brings such feature. 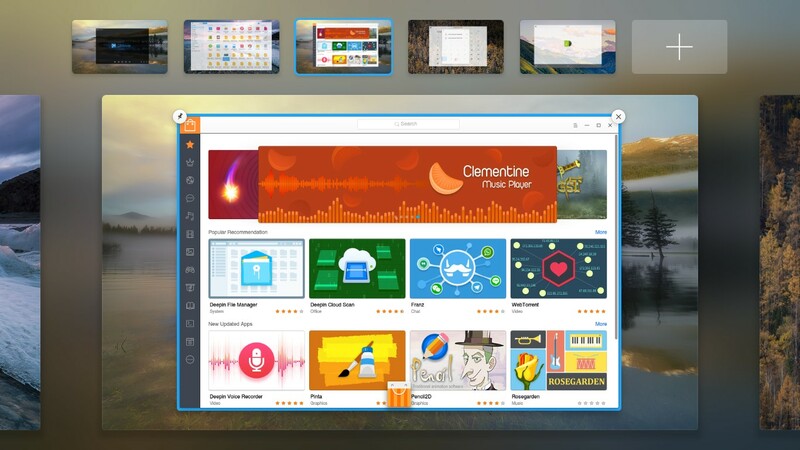 But again, Deepin Team made this simple and pretty, with just two slide buttons, a drag-n-drop picture to change background, and drag to rearrange entries. If you want to see Details, OS version and hardware summary, you see it on sidebar. Scroll to the most bottom. It lies over License and Startup Menu entries. 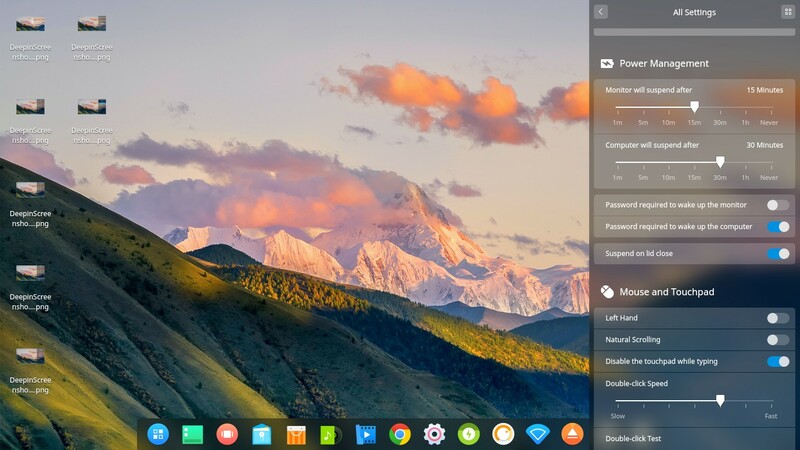 It shows generic info such as deepin version (15.4 Desktop), architecture (64Bit), processor & memory. It shows the name of deepin developer as well, Wuhan Deepin Technology. The dock has two modes, Fashion (default) and Efficient. Those are just the languages. Actually, Fashion is the MacOS-like dock, and Efficient is the Windows 7-like taskbar. 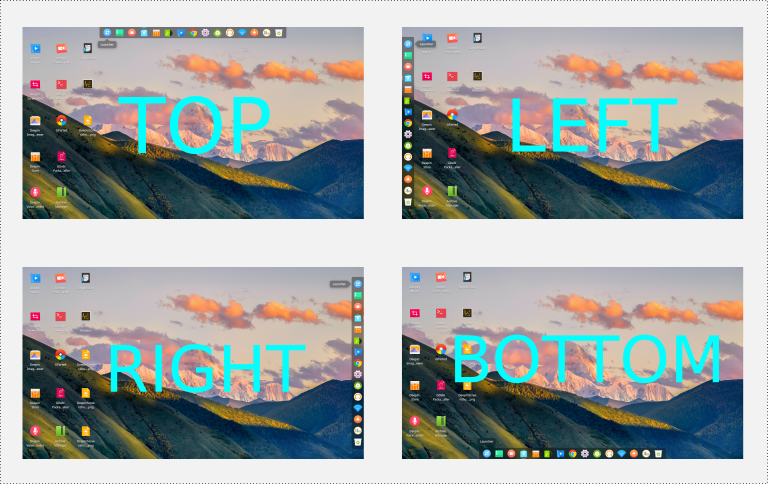 Deepin Dock features multiple size selections (large-medium-small), locations (top-bottom-left-right), and smart hide (hidden-shown-smart). 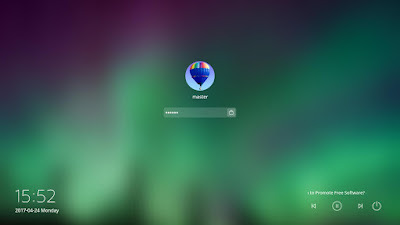 I can grasp the deepin dream here to attract both Windows and MacOS users by this feature. And furthermore, KDE and Cinnamon users might be interested to deepin by this. The panel mode resembles Windows 7 taskbar so much. I can understand this feature is for Windows users. You can enable this mode by right-click on dock > Mode > Efficient Mode. Again, this panel and its tooltips are translucent following 15.4 style and that's beautiful. This is the default mode. It can also be placed on the 4 edges of screen. The dock has standard features like add & remove icons, eject disks, control sound volume, and session control (shutdown/logout). deepin 15.3 can play MP3 by default using Deepin Music. It supports OGG audio as well. The interface is simple, with all buttons on bottom panel, without any menubar (so it's different to Rhythmbox or Amarok). It supports favorite features such as playlist, shuffle, replay, lyric, resume from last position, and custom shortcuts. As you may guessed, Deepin Music is also simple in features, it doesn't come with advanced features like equalizer, visualizer, speed control, repeat A-B, or such. Overall, this player fulfills the need of daily audio playing. 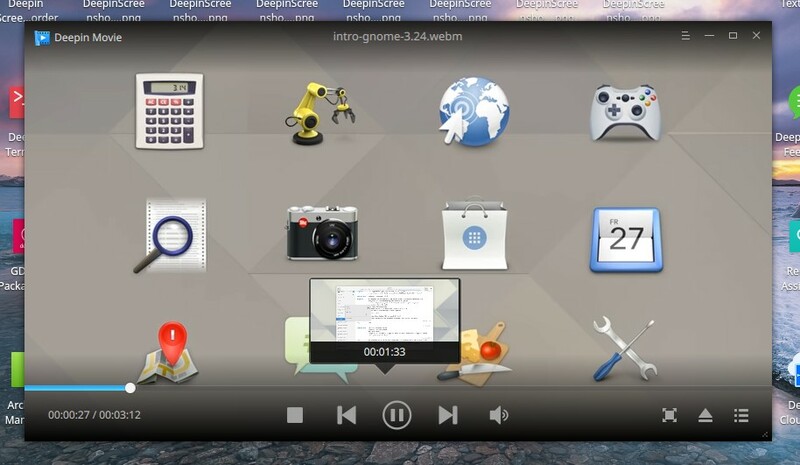 Deepin Movie can play well-known format (MP4, FLV) and also libre format (OGV, WEBM) videos. This video player is simple on interface but complete on features. While playing video it hides all buttons and even titlebar, to make it similar to cinema, but one click reveals all buttons. It may look simple, but it's actually has many favorite capabilities: playlist, subtitle, fullscreen, preview tooltip (similar to YouTube), repeat, custom keyboard shortcuts, recent files, and play video from URL. 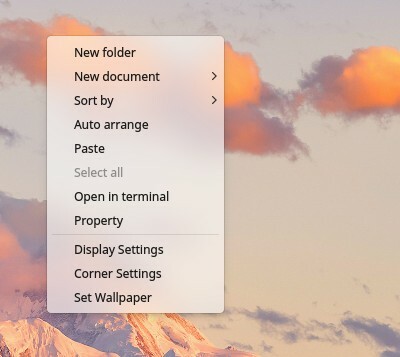 Menu in deepin has 2 modes: default and categorized. 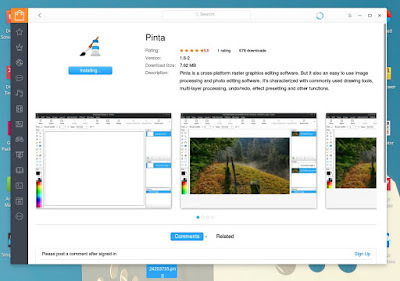 The latter is similar to Unity Dash on Ubuntu. You change menu mode by clicking on mode button on top-left corner. This menu is easy to navigate (it has only top-down movement) and easy to use. If you're familiar with adding shortcut icon on desktop (Windows) or on Dock (MacOS), you'll like this menu. Below I introduce you 4 awesome features of deepin menu. You can add any icon to Dock by right-click > Send to Dock. Also, you can add icon to desktop by right-click > Send to Desktop. This will give you the app shortcut on your desktop. 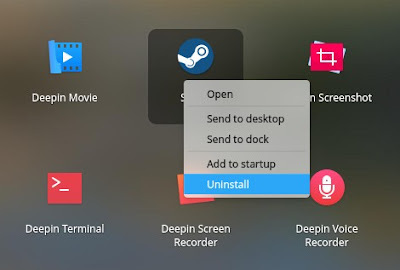 Beyond above two, you can also easily add any app to startup (will run every system starts) by right-click > Add to startup. This is a new thing on DE on GNU/Linux, because even Unity doesn't allow you to add startup this easy. The last and the best, you can uninstall any app by right-click > Uninstall > press Confirm while asked. 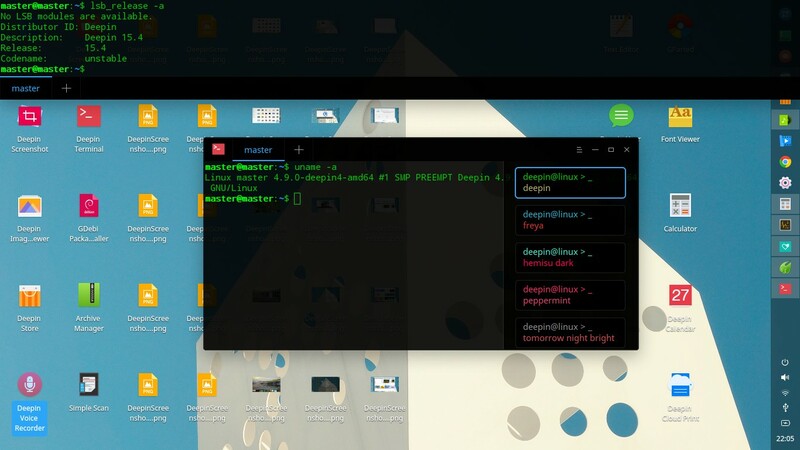 This feature is incredibly user-friendly for most non-tech people (and we actually found this on Android) and deepin is the first to bring this on GNU/Linux desktops. 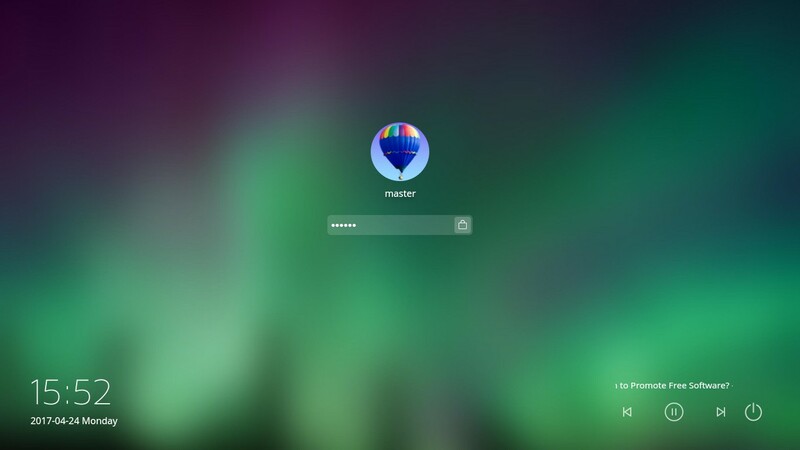 You can imagine even kids and old people can use GNU/Linux by using deepin because the menu is very easy to control. Anyway, by seeing the menu we can estimate that teaching GNU/Linux desktop to non-tech people using deepin will be easier too for us because its menu is undoubtedly easy. Good job, Deepin Team! If you missed icons on desktop while using another GNU/Linux or another desktop environments, something you loved so much on Windows, you'll have it back on deepin 15.4. It doesn't abandon this good feature, instead, it gives you amazing support from its menu (mentioned above). 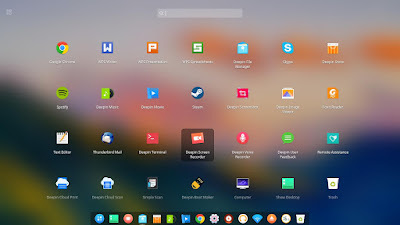 By using deepin you are not forced to "pin" icons only on panel, because you can place icons on both panel and desktop. Now you can quickly access again your favorite apps by your favorite method. When some desktop developers decided to run away from Windows by abandoning right-click on desktop, deepin gives this feature instead with beautiful translucent appearance. You can create new folder, auto-arrange icons, paste, select all, change wallpaper, change hot-corner, and change monitor settings. But please remember you don't have Refresh button here because the desktop is refreshed automatically. Drop shadow is everywhere, multiple desktop now can use different wallpapers, and spread window. All effects are enabled by default to make deepin aesthetic in all details. Press Super+W and all running windows will be spread with smooth animation. As you can see, drop shadow beneath every window miniature makes the whole desktop more beautiful. 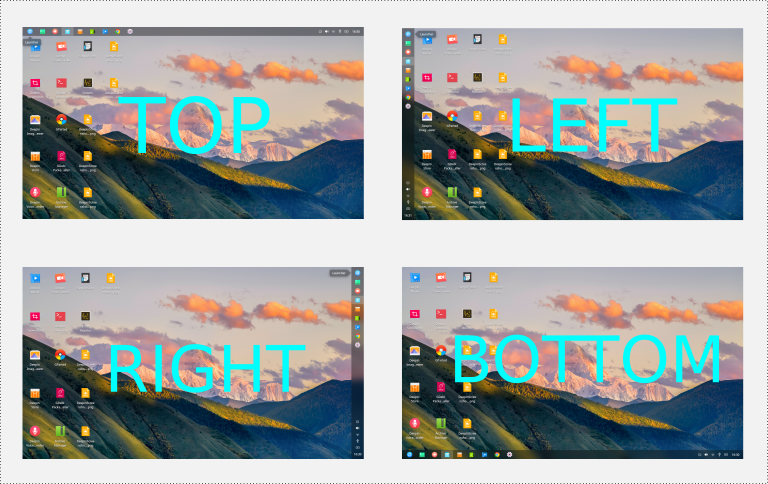 Every corner of deepin desktop has drop shadow. Yes, drop shadow always makes any desktop more beautiful. See the shadow beneath every icon, the Properties dialog, and the File Manager window itself. This feature is called Multitasking View and now it can use different wallpapers. It reminds me to the old Mandriva with KDE 3. It's still beautiful as always with Super+S shortcut and a plus button on workspaces selection. For those who don't know, this feature allows you to have more than 1 desktop (called workspaces) and place different apps on different workspaces. You move your app window by dragging them from one to another workspace. It's possible to work on browser in first workspace while your audio player on second and file manager copying huge files on third workspace. That's why it's called Multitasking View. The Deepin Store is gorgeous as well. 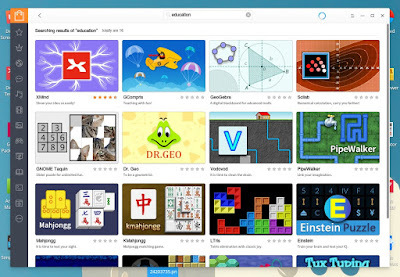 On Home page you get featured apps with huge artworks. 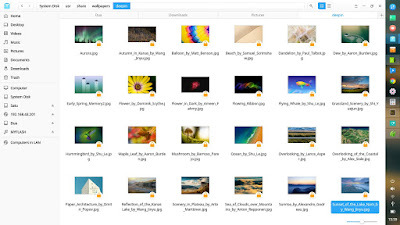 These artworks and also the screenshots for each app are created by Deepin Team. I can say this is a huge and amazing effort. Finding any app is very easy on Deepin Store. Just fire-up your internet connection and type some keyword. Here an example to find educational software via Deepin Store. Install any desired app is very easy too by just click on Install button. Remember you need internet access to install any software. It's very tidy and neat but I wish there will be a progress bar while installing. 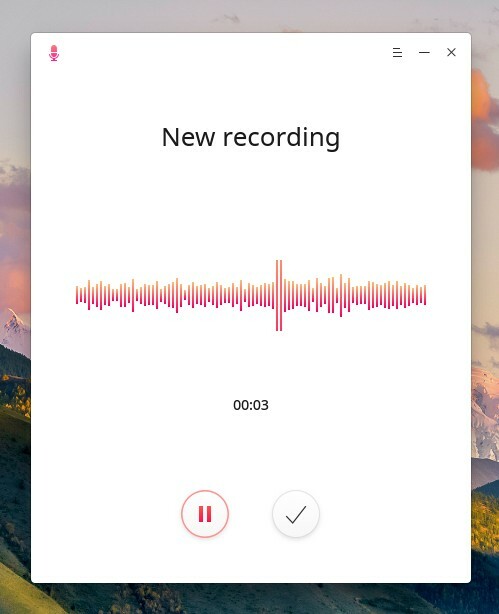 This 15.4 features the new Deepin Voice Recorder. It's similar to the old Sound Recorder featured on Ubuntu. But, this one is incredibly simpler with just one button on its screen, one action (to record), and it can play the recorded sound later. 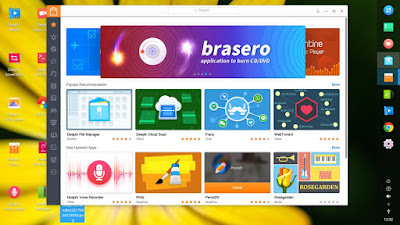 The simplicity is very clear here and it makes this app the easiest one to use on deepin 15.4 (besides the Deepin Boot Maker). To record sound, click on red microphone button. It shows a realtime digital wave as indicator of a record being held. After recording one, you can click on play button to hear the result. Again, it shows a realtime digital wave too as indicator. 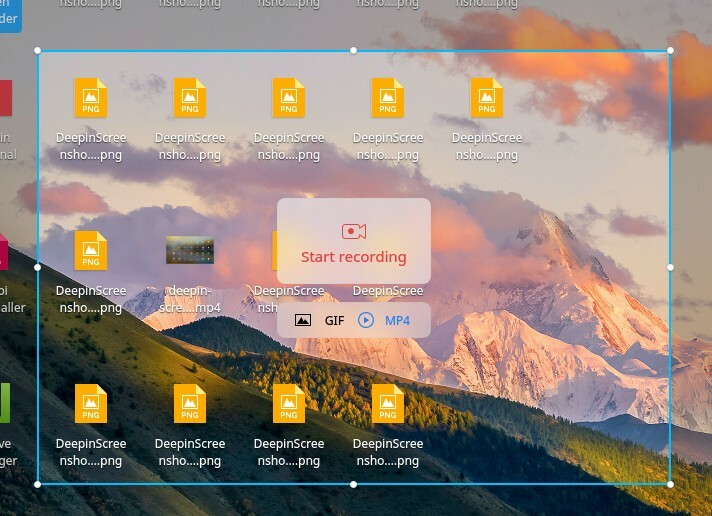 Another new app comes in 15.4 is Deepin Screen Recorder. 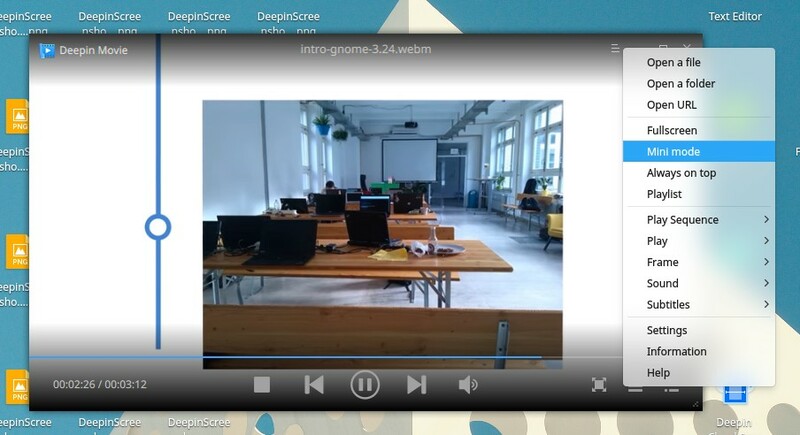 This DSR is similar to Kazam on Ubuntu that can record your screen visually as video. What makes DSR different is it's included by default, and it's incredibly simple, even simpler than Deepin Voice Recorder. DVR is simple but it still has a window. DSR has no window, it shows only a selection rectangle on desktop with only MP4 or GIF format choice on its center. 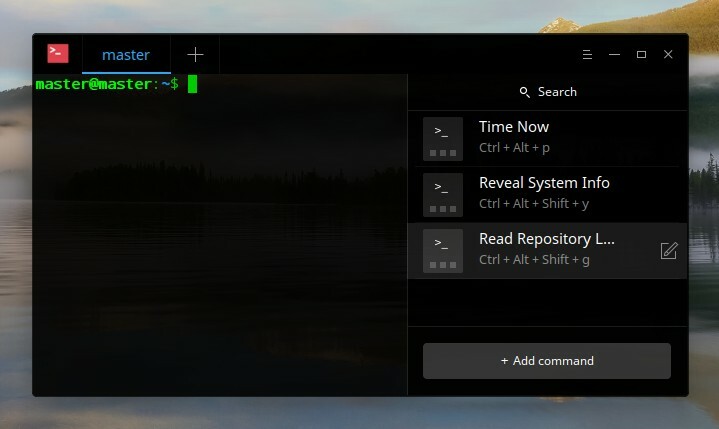 I can grasp Deepin Team intention on including this, so that any reviewer can make review video faster and then instantly upload them to YouTube and blogs. It's a very aesthetic and clever way to self-promoting deepin. 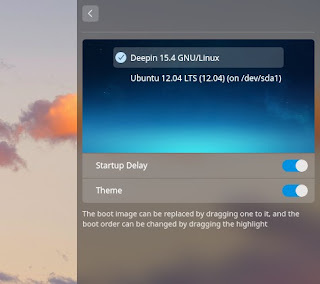 Good example to see deepin 15.4 simplicity design concept is this Deepin Boot Maker. 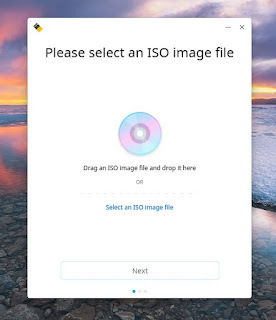 See, there is only one function "Select an ISO image file" on one frame. Adding such software in deepin is pretty good strategy to help users install any OS including future version of deepin itself. 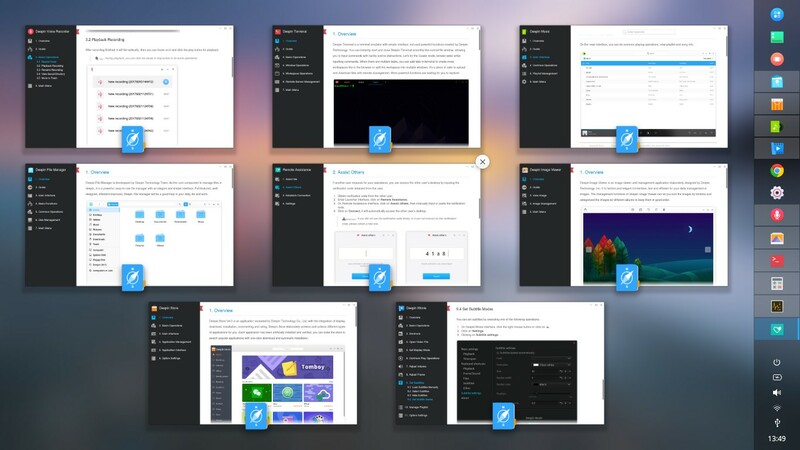 Deepin Team made reading user manual amusing and and really visual. That's a difficult job but they're successful in doing that. 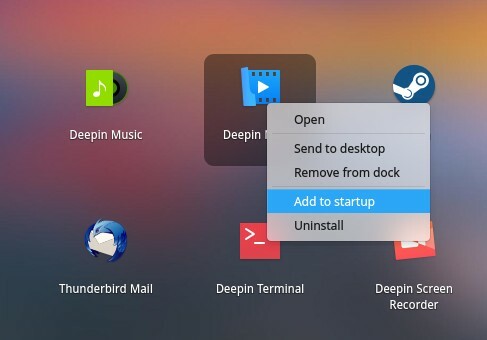 On every deepin native app, go to menu > Help, and you will see its help. All documentations are graphical with many screenshots and icons, and again with drop shadows they become beautiful documentations. 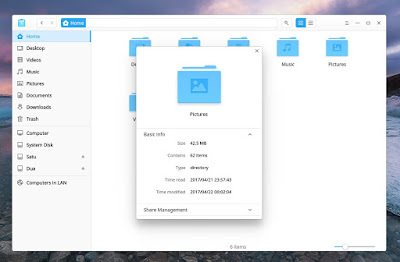 You will see the help for Deepin File Manager is arranged diligently and shown as pretty as possible, same goes another helps. The only native app that doesn't have help is Deepin Calendar. The underlying program of this documentation system is dman. This reminds us to UNIX man on console. In UNIX, you type command man program_name and Terminal shows the user manual. But in deepin, you type command dman program_name and the graphical user manual appears. Try to type dman deepin-movie and you should see help for Deepin Movie, and so on. The only difference here is that dman is graphical. Deepin Terminal reaches version 2.1 at 15.4. This terminal is simple outside but full-featured inside. It has Quake-mode (F2), a top-down terminal like Guake and Yakuake on GNU/Linux. It has a quick theme changer (shown below), split window (like Emacs or Terminix), custom shortcut keys, custom command (new feature), and remote management (new feature). Custom commands look like this. It's nothing new, just a visual shortcut for command you determine, but it's still awesome. You can assign your favorite command (such as ping) with your own keystroke (such as Ctrl+Alt+G) and later invoke it anytime. Remote management is nothing new as well, except its visual representation. You can make a shortcut to SSH login to your remote computers, for example, your own laptop (it should have openssh-server installed). To use it, just click on a shortcut and be connected. By this, you don't have to type any command anymore. These two features aim for non-tech users so they can live daily life using GNU/Linux with less commands. 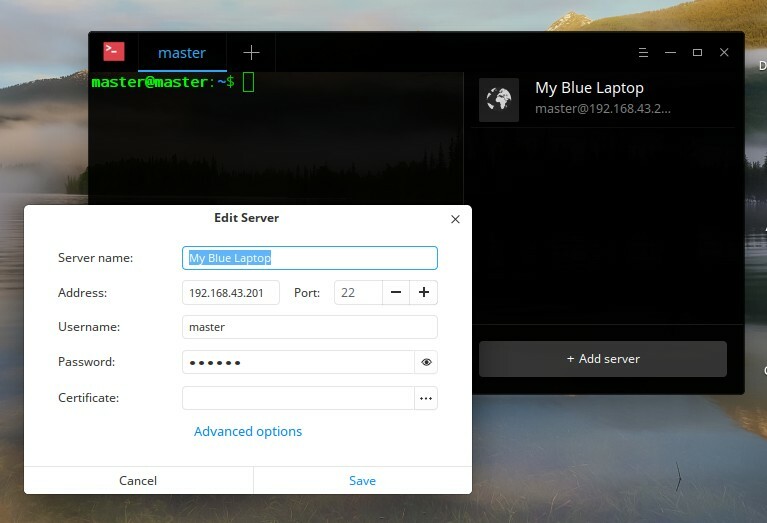 deepin 15.4 is really beautiful in every single detail. 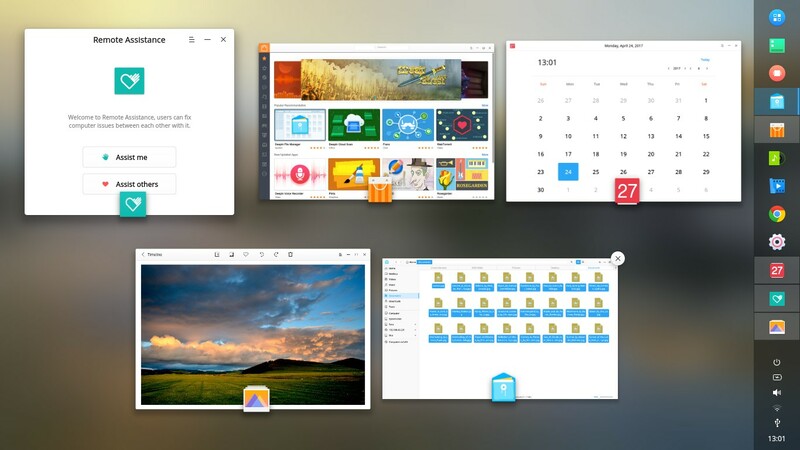 The beauty of deepin lies on its simplicity, drop shadow and translucency style, with completeness of feature. All the beauty cost only around 730MB of RAM at idle time. It's so user-friendly until I believe kids can use GNU/Linux easier with this. It has its native applications that are fulfilling daily needs, complete in feature, and always with pretty look. The desktop menu understands the users, with greatly accessible features. The Control Center is great as well, making the users have complete control with less learning curve. I believe anyone formerly using Windows, MacOS, Android, even any GNU/Linux distro will be easy to switch to deepin 15.4. You can help deepin development by many ways! You can donate to deepin. You can get involved in coding (if you're programmer), artistic works like making icons/themes/wallpapers, and also language translation. See Development page to join.